In the Android world, things change very quickly. The folks at Google are always creating new features and new tools. The old tools stop working and the old instructions no longer apply. If you see something on your screen that doesn’t look like familiar, don’t despair. It might be something very new, or you might have reached a corner of the software that is a dark corner. 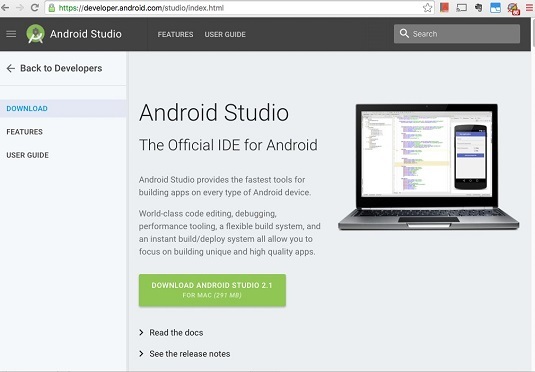 Visit Android’s Developer website.The page has a big button for downloading Android Studio. The Android Studio download includes the much-needed Android SDK. The web page may not look the same, but you’ll still see an Android Studio download. Agree to all the legal mumbo-jumbo. Save the download to your local hard drive.If you run Windows, the downloaded file is probably an .exe file. If you have a Mac, the downloaded file is probably a .dmg file. Of course, there are no guarantees. The downloaded file might be a .zip archive or maybe some other exotic kind of archive file. What happens next depends on your computer’s operating system. In Windows: Double-click the .exe file’s icon. When you double-click the .exe file’s icon, a wizard guides you through the installation. On a Mac: Double-click the .dmg file’s icon. When you double-click the .dmg file’s icon, you see an Android Studio icon (also known as an Android Studio.app icon). Drag the Android Studio icon to your Applications folder.